← Is It Baseball Season Yet? 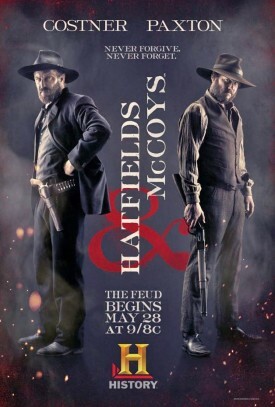 Hatfields & McCoys is a 2012 History Channel three-episode miniseries about the legendary feud between the two families. It has a pretty solid cast, starring Kevin Costner as “Devil Anse” Hatfield and Bill Paxton as Randall McCoy, and featuring Tom Berenger, Powers Boothe, Jena Malone, and many other recognizable faces. It was directed by Kevin Reynolds, who is perhaps best known for directing the Kevin Costner classics Robin Hood: Prince of Thieves and Waterworld. The Hatfield-McCoy feud was a nasty and ongoing rivalry between two families that raged for years. It started over the murder of a McCoy, it escalated with accusations of pig stealing, and it resulted in a number of fights, battles, legal trials, and deaths over the course of a few years. These were the days of pride and honor, and you were expected to fight if someone insulted your good name. This miniseries goes over most of the events that escalated the feud. You see why they started fighting and why they never stopped. It’s a story that can’t be confined to a two-hour running time. It’s pretty solid for the most part. It has a tendency to slow down and lose momentum from time to time, but there is enough action and snappy dialog to keep things flowing. I think they spent a bit too much time on the love triangle between Johnse Hatfield, Roseanna McCoy, and Nancy McCoy. It seemed like they threw it in there to pad out the running time. Surprisingly, Kevin Costner doesn’t have the worst accent in the production. Bill Paxton’s Southern drawl is terrible, but it becomes a lot more bearable if you put it on mute. I didn’t watch it when it first came aired on the History Channel. I only saw it for the first time a week ago on Netflix. It was good. I liked it enough to write about it. Check it out if you like Kevin Costner, Bill Paxton, docudramas, or lengthy feuds between families that aren’t yours.